Yacht Travel Lift Manufacturer Has Low Price High Quality Boat Hoists For Sale! 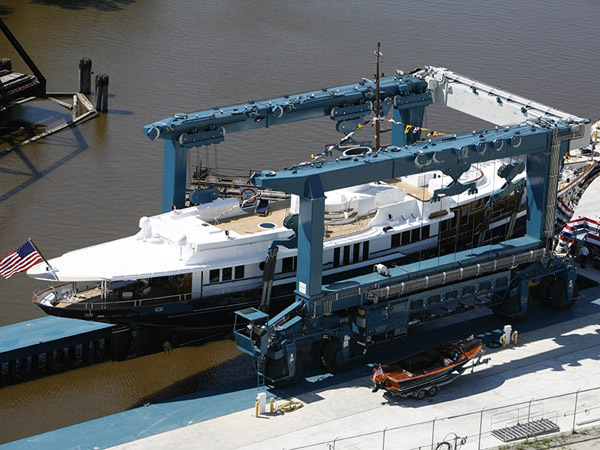 Yacht travel lift is mainly designed for lifting vessel from water or putting vessel into water. 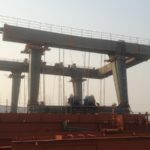 This kind of gantry crane is also used for vessel maintenance. Thus it is amphibious. Yacht boat hoist has terse structure, light weight, simple system. It is fast to install, convenient to use, safe to operate and portable to move. 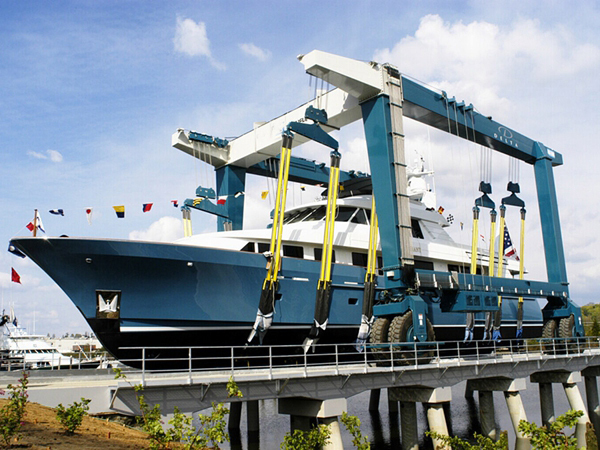 Yacht travel hoist crane has different lifting tons, for light duty, it has 10 ton travel lift, 25 ton marine travel lift for sale, 50 ton boat hoist, for heavy duty, it has 200 ton marine travel lift for sale, 500 ton mobile boat lift gantry crane, 1000 ton marine travel lift. Ellsen Group, a professional travel lift manufacturer in China, provides types of boat hoists for sale, such as port used small travel lift boat crane, construction travel lift, travel lift for water sport meetings, aquatic club, voyages, ISO approval marine travel lift, steady safe driving hoist. Ellsen provides customized service! Customers can purchase the most suitable travel lift according to practical needs and requirements. 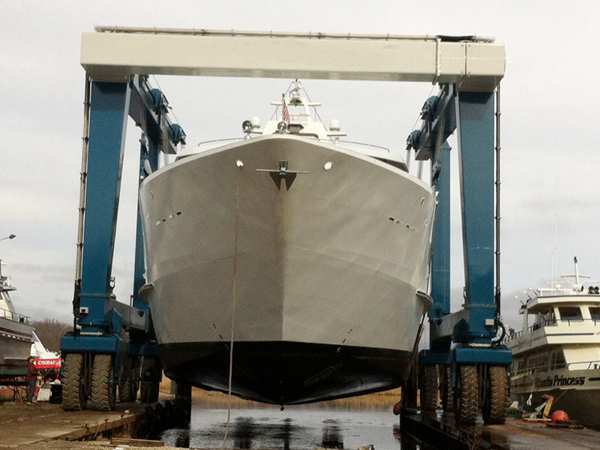 How to save cost for purchasing yacht travel lift? One set of vessel travel lift costs at least ten thousand dollars. Large yacht travel lift costs more. Grasping some skills can help customers save much cost. First, choose a professional manufacturer and supplier. This can ensure reliable quality and steady performance. For example, Ellsen provides all products with serious check and careful package to ensure good condition. Second, the supplier has strength. It has its own factory or cooperates with powerful factory. Then the supplier can sale products at factory price. Customers can purchase cost-effective travel lifts! 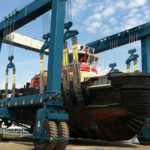 Third, purchase marine boat hoists with suitable lifting tons. For light duty, small boat hoist is good. It can increase efficiency and improve working condition. For heavy duty, high lift capacity travel lift is great! It makes lifting work easier and safer. What are marine travel lift prices? Marine travel lift price is related to many factors, such as crane quality, travel lift design, lifting capacity and boat lift supplier. 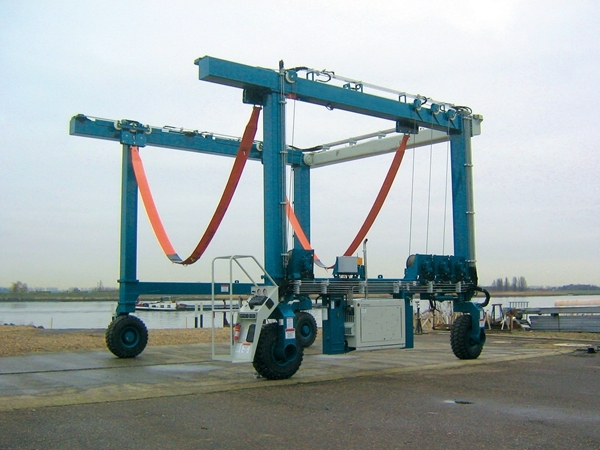 Every boat lift crane has advantages and features, this also influence the price. Choose a famous travel lift brand or choose a common boat lift supplier? 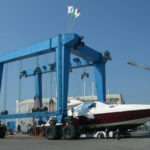 The wise choice is to purchase a cost-effective boat lift crane from professional manufacturer. Professional crane suppliers can provide reliable service and product for customers. 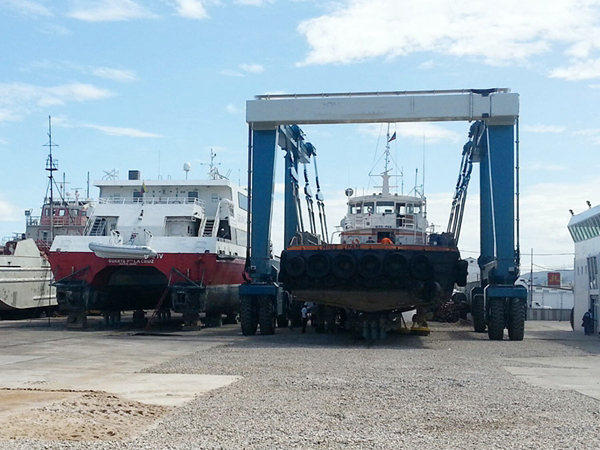 For heavy duty boat lift crane, the price is higher than that of light duty travel lift. Large travel lift has more serious safety standards. It is equipped with complete safety protection devices, such as overload protection device and over-speed protection device. 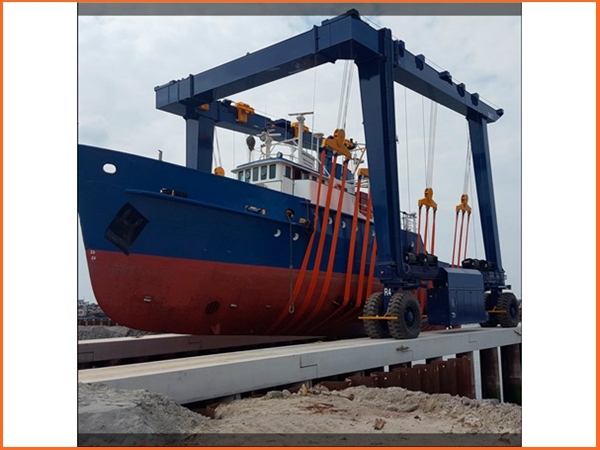 Ellsen sales marine boat lifts with affordable price, because Ellsen always puts customers on the first place, and provides top quality boat hoist crane with reasonable price. 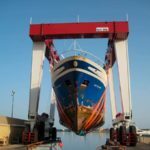 How to find professional marine travel lift manufacturers? First is to getting advice from person who bought boat lift once. This is the most direct way to get reliable information about travel lift manufacturers. If the person gives high praise of the manufacturers, this shows that the supplier is pretty good. Second is to surf the boat lift manufacturer information on the internet. The more details you get, the clear image of the manufacturer you know. Third is to visit travel lift supplier directly. This also helps customers know more information about travel lift manufacturers. 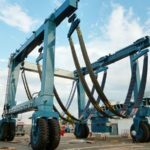 Sling is one of important parts of marine travel lift systems. It is essential to inspect and replace the sling. This is related to secure the safety and productivity of boat lift. If the following problems exist, remove the sling from service in time. First, the sling identification is missing or illegible. National industry standards require all slings shown with rated capacities and types of material. Second, there is acid or caustic burns. Third, any part of slings is melting or charring. Fourth, for any holes, tears or snags, replace the sling immediately. Fifth, abrasive wear is also damage for sling safety. Sixth, knots in any part of the sling is not available. Seventh, excessive pitting or corrosion, cracked, distorted or broken fittings are dangerous for sling safety. Eight, for some visible damage that causes strength of the sling, stop using the sling timely. Ninth, pay attention to visible red tracer threads. 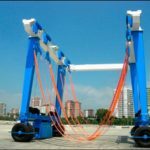 Mobile rubber tyre gantry crane for lifting boat is a kind of dedicated hoisting machinery which is used for boat water work up and down & land transportation. It’s mainly used for coastal ports. Crane travelling mechanism adopts tyre running mechanism and can achieve 360°rotation. Whole Crane is controlled by hydraulic and electrical equipment safety and reliable because of the compact structure. 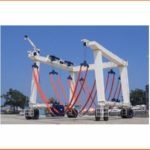 The mobile boat hoist can handle 5~500t boats or yacht from the shore side according to your needs. It can be used for the maintenance on the shore side and can put the new boat under the water. It adopts the soft and firm belt to lift the boat, yacht. So it will never hurt the surface. It also can put the boat in sequence quickly with small gap between each two boat,so that save the storage space.